Sushi restaurant and cocktail bar chain Sushisamba is preparing to open its fifth venue, which will be based in London’s Covent Garden. The sushi bar will take over the Opera Terrace atop Covent Garden’s Market Building this November. The new site will join the chain’s portfolio of venues, which includes restaurants in London, Miami, Las Vegas and Amsterdam. 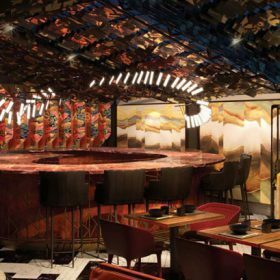 The interior design for Sushisamba Covent Garden has been influenced by the spirit of Japan, Brazil and Peru, and was conceived by Antwerp-based Too Many Agencies. The restaurant, which runs along the entire east side of the market, features a glass roof and boasts views across the piazza. “The history, culture and revitalised energy of Covent Garden is deeply inspiring,” says John Um, Sushisamba corporate chef. As part of its beverage programme, Sushisamba Covent Garden will offer one of the largest premium saké selections in the world, as well as a robust Japanese whisky collection. Head of spirit and cocktail development, Rich Woods, has created an expansive list of signature cocktails for the new venue. Drinks include Tom Yam, a fresh and fiery cocktail made with vodka, coriander, ginger, lime leaf and chilli; and the Lychee Cooler, which mixes vodka with lychee juice, coconut milk, vanilla syrup and elderflower. The new venue will also feature the venue’s ‘signature’ Sambatini taps, which serve up kegged cocktails created with the season’s freshest ingredients. The food offering at Sushisamba Covent Garden will showcase a culmination of Japanese, Brazilian and Peruvian cuisines. Dishes on the menu include pork belly with butterscotch miso, scallops with vanilla, jalapeño, mango and aji amarillo and octopus with aji panca, peppers and nori.